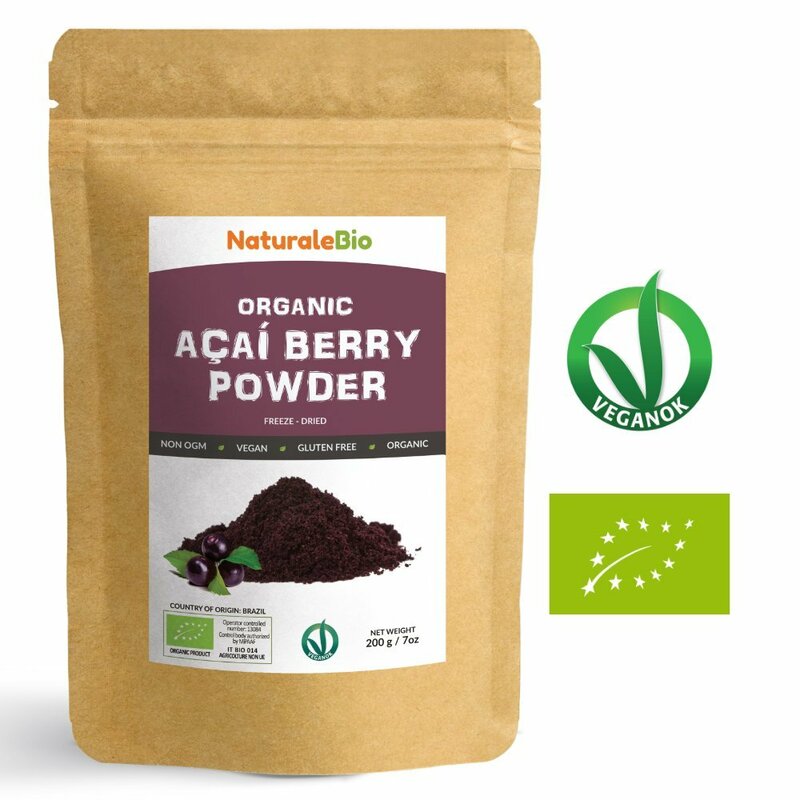 HomeGroceryOrganic Açai Berries Powder [ Freeze-Dried ] 200g | 100% Pure Brazilian Acai, Lyophilised, Raw. Extract from Acai Berry Pulp. Superfood Rich in Antioxidants and Vitamins | Vegan & Vegetarian Friendly. ✔ ORIGIN OF ACAI: Açaí is the dark purple berry fruit of the açaí palm, which originates from Amazon rainforests. Organic açaí berry powder is considered the best way to integrate this precious fruit into your diet. Açaí berries have a pleasant taste similar to blueberries and chocolate, and can be dissolved in water, milk, smoothies or breakfast drinks, in order to make its consumption easy and pleasant. ✔ PROPERTIES OF THE AÇAI: 1 Contains high levels of essential fatty acids such as omega-3, omega-6, and omega-9, as well as monounsaturated oleic acid. 2 It is rich in antioxidants 3 Contains 19 healthy amino acids for our body. 4 Contains dietary fibre. 5 It is rich in minerals and vitamins such as calcium, phosphorus, beta carotene, and vitamin A and C.
✔ 100% PURE, ORGANIC CERTIFIED AND VEGAN CERTIFICATE: 100% Pure and Bio. Free from the use of pesticides and unnatural chemical fertilisers, which are of no help to the body and health. NO GMO, without Gluten, and without Lactose. Produced in Brasil, it is organically certified by inspection bodies authorised by the Ministry of Agriculture. ✔ ACAI FREEZE – DRIED (LYOPHILISED): By using advanced technology, we freeze and grind this super-food at low temperatures, whereby we preserve all the typical nutrients of the açai powder. ✔ AT YOUR COMPLETE DISPOSAL: Customer satisfaction is our priority. Please get in touch if you have any questions, issues or feedback to do with your purchase. Your opinion is extremely important to us, and will help us improve our services.